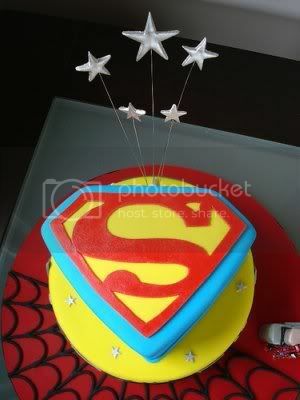 Kathryn, a cake-making enthusiast from New Zealand, offers this hand-made homage to three of my favorite superheroes: Batman, Superman, and Spider-Man. This vanilla bean and yogurt cake features layers of berry filling and buttercream, and fondant detailing. (Read just this next part in your best Casey Kasem voice.) But the sweetest part of this tale… isn’t in the frosting. It’s in the long-distance dedication Kathryn sent out to her friend-in-need, Maara. Here’s their story. Hey, that Death Star cake featured on Boing Boing looks like stupid poo meat! This is an injustice. I deserve to be featured on Boing Boing. Yeah. I bet if I whine and plead enough, I can engineer my brother’s birthday into an excuse to have my cake-artisan mom spend nine hours crafting a spectacular Star Wars cake, the likes of which have never been seen on the internet tubules! Then I’ll blog it, make the front page of Digg, and become King of the Geeks for fifteen illustrious minutes! The glory will be mine! Mine! Bua! Bua! Bua-ha-ha-ha-ha! Before you judge me, know that I did magnanimously allow my brother to enjoy a slice of his birthday cake. Once he had thoroughly documented it with his professional-grade camera for my blog. First thing’s first, after all. Kathryn operates at the other, far-distant end of the spectrum of cake-baking selflessness. Six months ago, Kathryn’s good friend Maara was diagnosed with an aggressive form of breast cancer. New Zealand doesn’t fully fund the drug treatment Maara needed, so Kathryn started a blog to fundraise the $93,000 that would cover the remaining costs. Kathryn’s idea to use her fantastic cakes as a fundraising tool helped the blog take off, and four months later they reached their target. Maara is now receiving the life-saving treatment. Cupcakes to match with fondant toppers. I’m moved to the point that I’m not even tempted to poke fun at the completely unmanly stars (strongly reminiscent of Lynda Carter’s Wonder Woman) protruding from the top of this otherwise-striking cake. Kathryn, thanks for sharing the story and the photos. Cheers to you for your talents and your altruism. Please let Maara know that a small cadre of geeky souls in the U.S. is rooting for her speedy recovery. I love it! Cake for a good cause — and it looks dee-licious, too! Hooray for Kathryn, and hooray for cake! That’s an awesome looking cake! 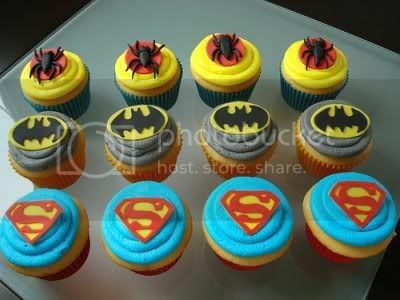 Awesome cakes! But what do they taste like? 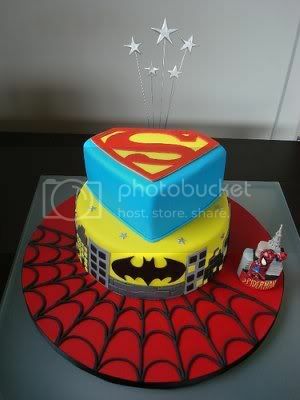 I bet Superman’s cake tastes like justice, Batman’s like cold vengeance and Spidey’s like bug guts. That’s a really neat story. You made my day. They are absolutely amazing! What a labour of love! I am moved by the dedication to detail and to friendship. Prayers to Maara for her health and blessing to her friend Kathryn for her efforts. It’s a beautiful thing! You know that rooting for a kiwi means something different to them than you right? So amazing! Thank you for such an amazing inspiration! Previous post: Reader Poll – How did you like Cloverfield?